South Africa's Rifle and Ammunition stores provide good quality ammunition for almost all types of calibers. You will be asked for your rifle's license/prove of rightful ownership. All you need to know is the caliber of your gun and the type of game you intend to shoot, and you will be assisted accordingly. Buying up to 50 or 60 rounds for each rifle is more than enough to see your rifles sighted-in and leaving you with the ammunition needed for your trophy. Because game hunting would almost surely result in the client paying trophy fees for lost/wounded animals (after a shot was fired), it is important to aim with the firearm suited best for the type of game that you plan to shoot. Yet, it is possible to shoot quite a wide range of game with a mid-range rifle like the .300 caliber. If the caliber is extended to a .375, hunting the Big Five becomes possible, while it still suites a whole number of the bigger antelopes and the hunter wouldn't bother about bringing his whole armament to the hunting ground. Usually, hunting with a medium caliber like a .270 or a 30.06, would do quite well for most of South Africa's larger antelopes. Smaller antelope could be brought down easily with a well aimed shot from a .222 to a .243 caliber. Almost all game-camps will provide a suitable shooting range where sighting-in of the rifles will be possible (Marvel Africa Safaris have a shooting range at our main camp in Limpopo). Travel and moisture-levels surely have an influence on the accuracy of the rifle. Most safaris starts of with the sighting-in of the hunting rifles. In the case of rifle-defects upon arrival, most professional outfitters will be able to provide a substitute, while fixing the gun would surely be a possibility (either at the game-camp or at a nearby rifle-workshop). The customary sighting-in will take you to the 100 yards-mark (91meters), where your rifles could be zeroed-in (or, as some hunters prefer, being 25 - 40mm high at 100 yards) with the necessary equipment which the outfitter will provide. Under certain conditions, unplanned borrowing of rifles from the outfitter may be possible if the hunter runs into trouble with his own. Usually, it will be perfectly possible to rent/hire a firearm from your outfitter or professional hunter, as most of them offer a wide variety of rifles with different calibers. It could be worthwhile to make this issue a talking point with the outfitter before departure, saving an unnecessary import. But at least, the hunter should confirm if the outfitter does have the caliber available that will suite your hunt's needs. 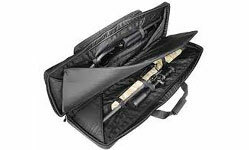 Most hunters prefer to bring along their own rifles/guns. With the exception of fully automatic weapons, the import of weapons for temporary use in South Africa, won't cause the hunter much trouble. Such a temporary permit is valid for six months. It is advisable to check such imports with your outfitter or professional hunter first, for it may, at least,cause time-consuming delays if the hunter also wishes to tour to neighboring states as well. All handgun hunters who wishes to sport the stalking and handgun game in the South African setting, will be most welcome to do so. Areas may be selected that suite handgun hunting best.